New survey from #3M uncovers challenges and optimism about preventing #HAIs. Data shows 51% of #clinicians think lack of adopting new technology & protocols and insufficient support from senior leadership are key barriers to #infectionprevention. ST. PAUL, Minn.--(BUSINESS WIRE)--A recent survey of infection preventionists found that half (51 percent) believe lack of adopting new technology and processes and insufficient support from senior leadership are the top barriers to preventing healthcare-associated infections (HAI), followed closely by poor protocol compliance rates. 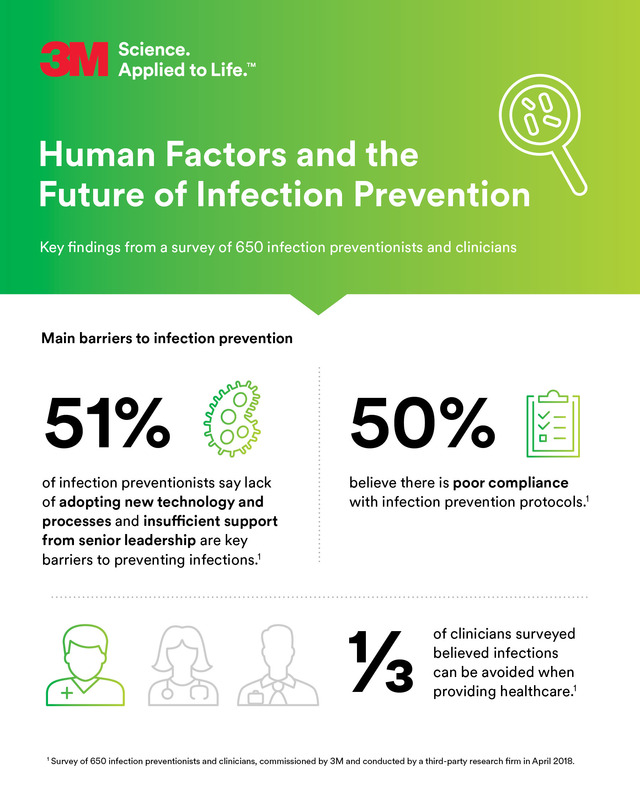 Six hundred and fifty U.S. infection preventionists and clinicians responded to the survey, “Human Factors and the Future of Infection Prevention,” commissioned by 3M and conducted by a third-party research firm in April 2018. Despite the barriers, clinicians surveyed were optimistic about their ability to improve infection rates. One-third believed infections can be avoided when providing healthcare. Survey data also indicated these clinicians are seeking technological advances that will help them reduce preventable infections. 3M is hosting a series of infection prevention educational events, starting with a webinar on July 11, 2018, to discuss in more depth the barriers to infection prevention revealed in the survey. Visit 3M.com/IPSurveyWebinar to register. Upcoming educational events will reveal survey findings on clinicians’ attitudes and beliefs about infection prevention trends, best practices, compliance, auditing, and training.